I had a bad driver's side wheel bearing. It made a low rumbling on the freeway, not terrible, but noticeable with quiet tires. It sounded like it was coming from right where the driver sits which seemed the dead center of the car to me. The sound was really noticeable going into a sharp right hand turn and sounded like a rhythmic thrumbing or grinding. But you had to be turning into the corner pretty hard. Parked you could grab the top of the tire and push it in and pull it out and hear and feel a small click or clunk. Repeating the process with the other 3 wheels did not give the same result. 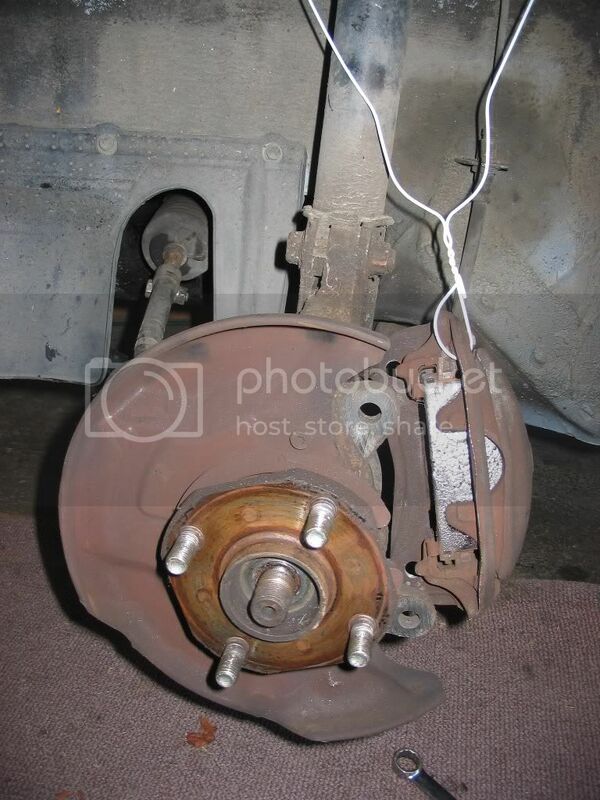 Jacked up with the caliper and brake rotor off the car it was easy to feel in and out movement of the hub. 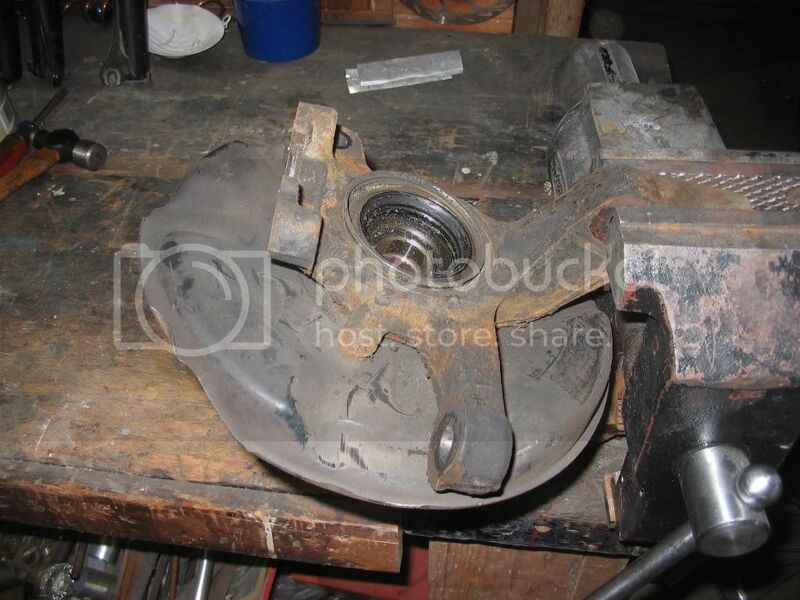 I had replaced a front wheel bearing on my '83 13 years ago using a hydraulic press so was uncertain if I could do it with screw pullers and a large bench vice but it worked fine. From start to finish was about 4 hours including test drive. 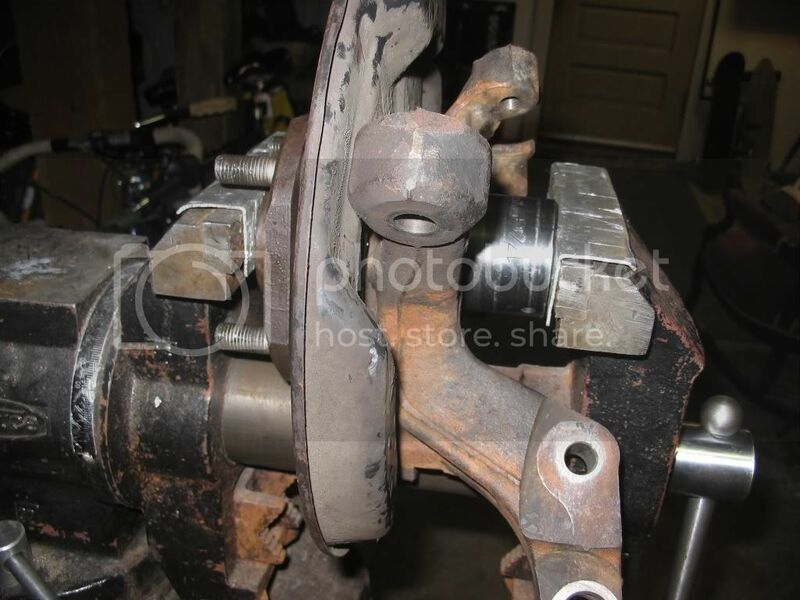 You need 2 people to get the front axle bearings on and off (the torque spec. is about twice what the engine puts out and presumably can damage the trans or diff unless your helper squeezes the foot brakes) and it would be helpful to have a partner to help hold drifts when pressing pieces apart or together. 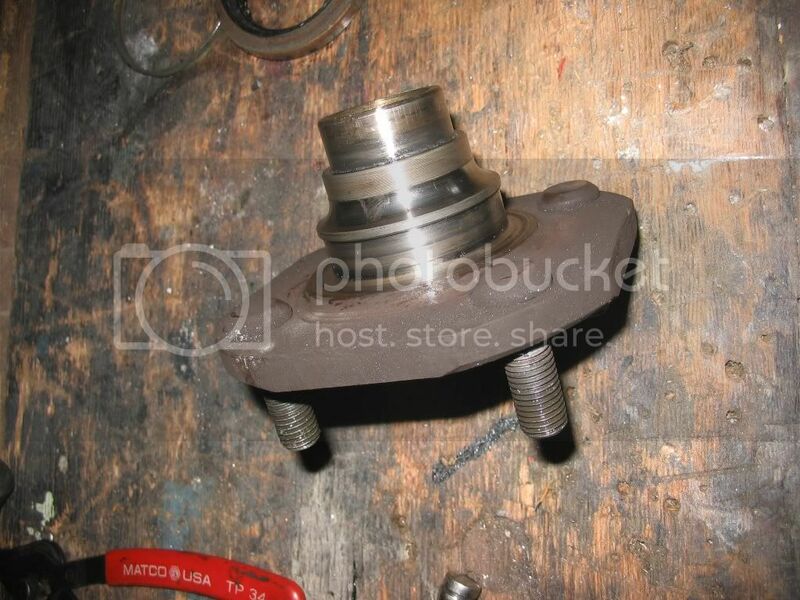 Pull the caliper off (17mm head bolts) and hang it from the spring using a coat hanger. 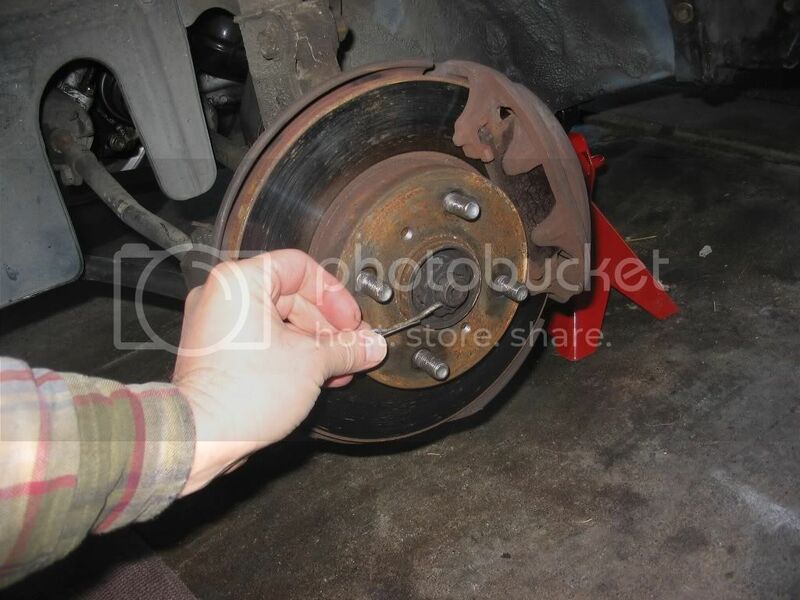 Pull off the brake rotor. Separate the tie rod end (14mm nut and cotter pin). I did this by prying down on the tie rod end with the breaker bar and whacking the eye that the tie rod taper goes through with a 3lb. hammer. A puller is a better way, because you risk splitting the grease boot with the hammer. 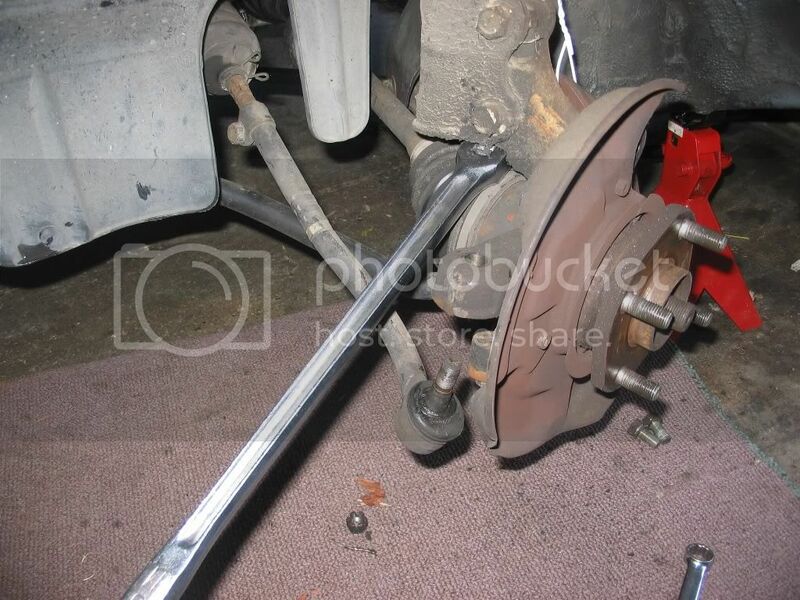 Then remove the lower ball joint bolts (14mm head). 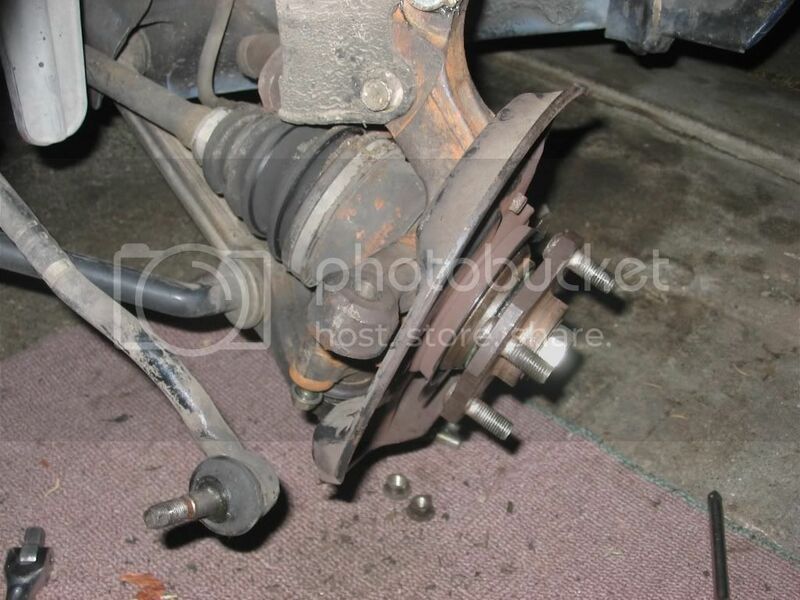 Remove the strut bolts and nuts (17mm heads) and pull the steering knuckle and hub off the car. I clamped it in the vice and used a large screwdriver to pry out the dust shield and inner seal. Used good needle nose pliers to pull the snap ring. Used a large impact socket to drive the hub out of the old bearing. 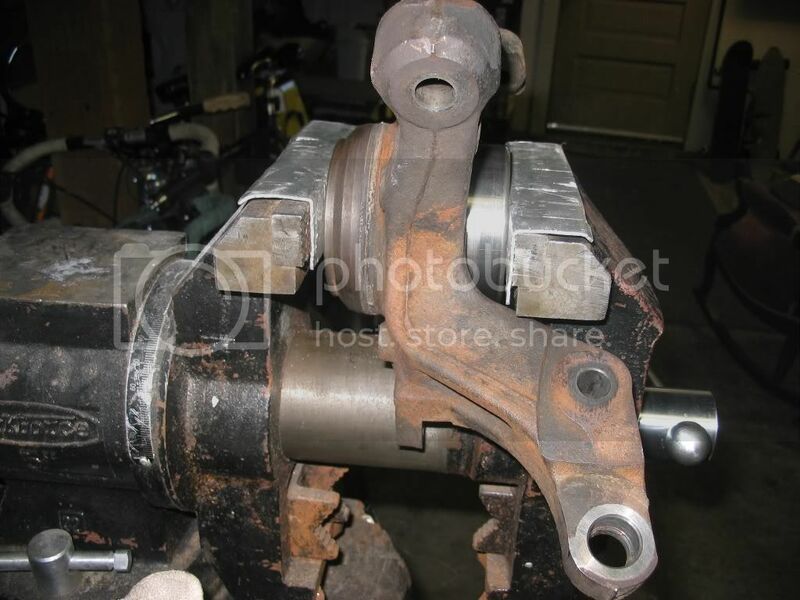 This did not take a large amount of force and I was able to leave the steering knuckle clamped in the vice. The Koyo bearing has a 2 piece inner race - in other words an inner-inner race and and outer-inner race - in addition to the outer race. 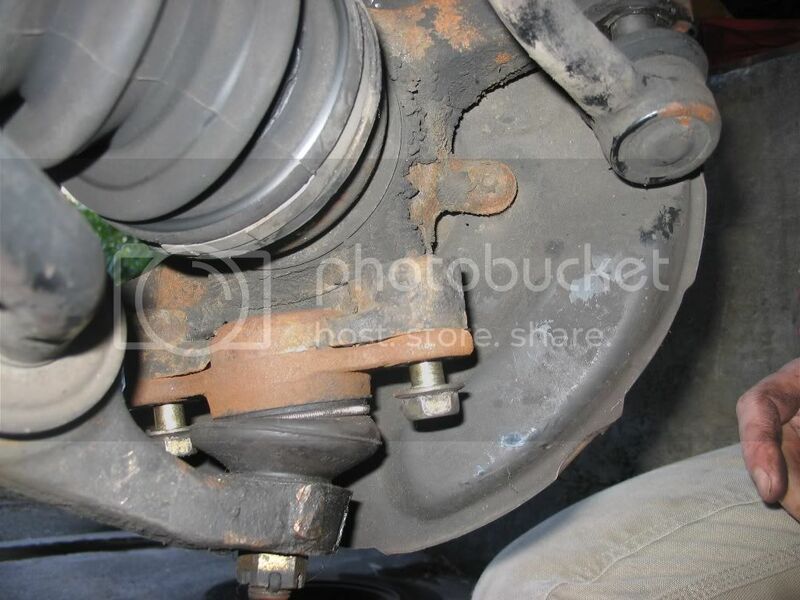 This picture shows the hub with the outer-inner race still stuck to it. I used a small puller to grab the outer-inner race and pull it off. I used a small cold chisel to start the process, but sharper puller jaws would have helped. 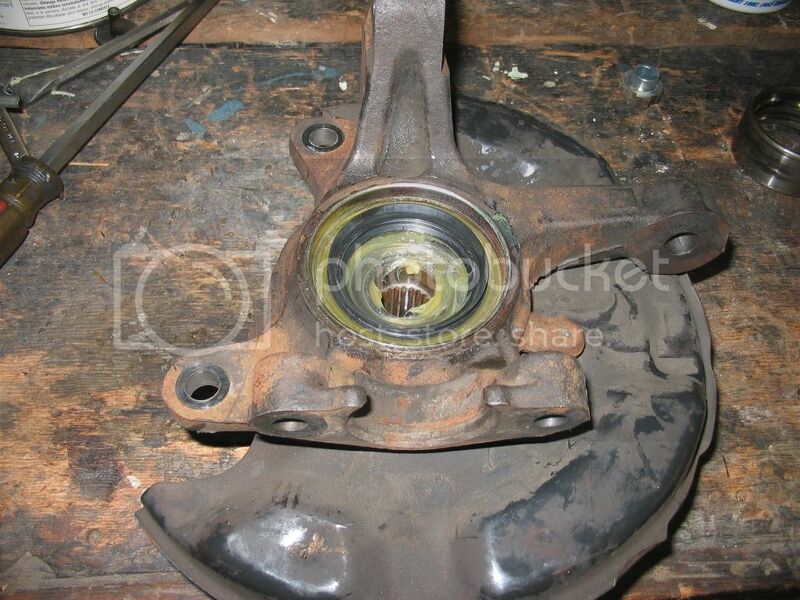 Here is the steering knuckle with the brake dust cover removed (3 10mm head bolts). The dust cover is sealed to the knuckle with silicon sealer. 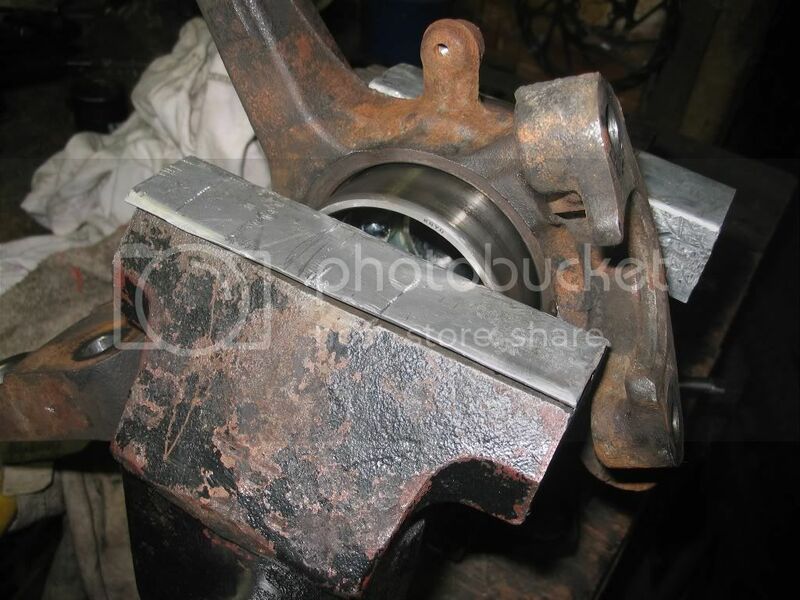 I heated the knuckle with a propane torch and then drove the outer bearing out using a large impact socket and a hammer. This didn't take a lot of wild pounding but did take a lot of smaller hits with the 3lb hammer. Here is the race when it came out. 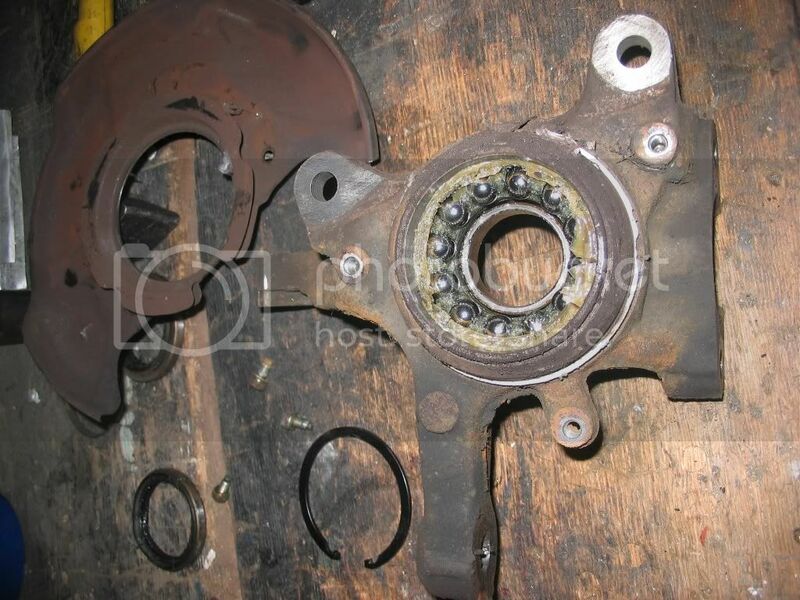 Because the grease was so clean and the races looked so shiny that the bearing might not be bad. But the outer race of the outer race shows dents around the inner edge of it. They are barely noticeable on either side of the 12 o'clock flare in this picture, but they are real. 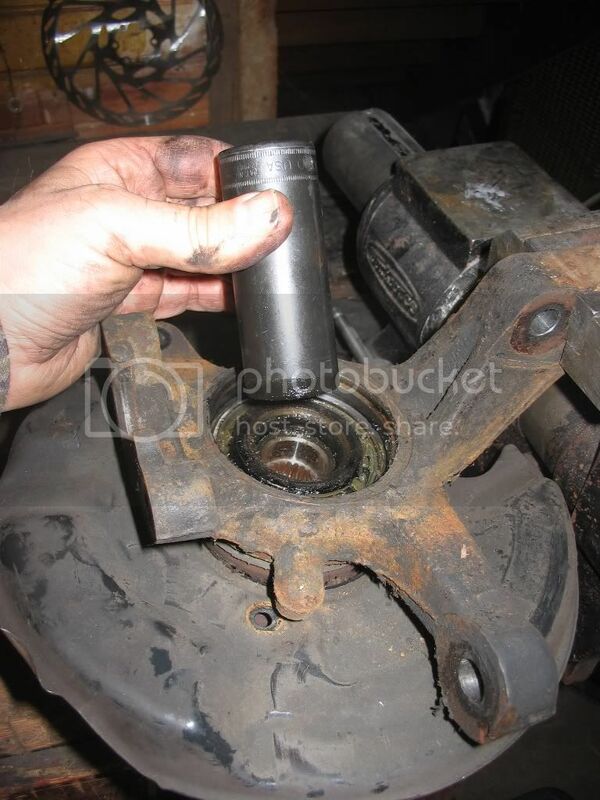 The next post will show how the new bearing was installed. Last edited by sdoan on Tue Apr 15, 2014 9:30 pm, edited 3 times in total. Funny - I don't have any pictures of the bare knuckle. I cleaned the knuckle with a wire brush and put it in the oven at 300 F hoping it would make it easier to press in the new bearing with the bench vice. I also put the hub and new bearing in the freezer. This step is where a helper would be nice. With the vice the helper could hold the knuckle in place while the other person locates the drift and tightens the vice. Or you could use a proper hydraulic press. I used the old outer race as a drift to push the bearing into the knuckle. 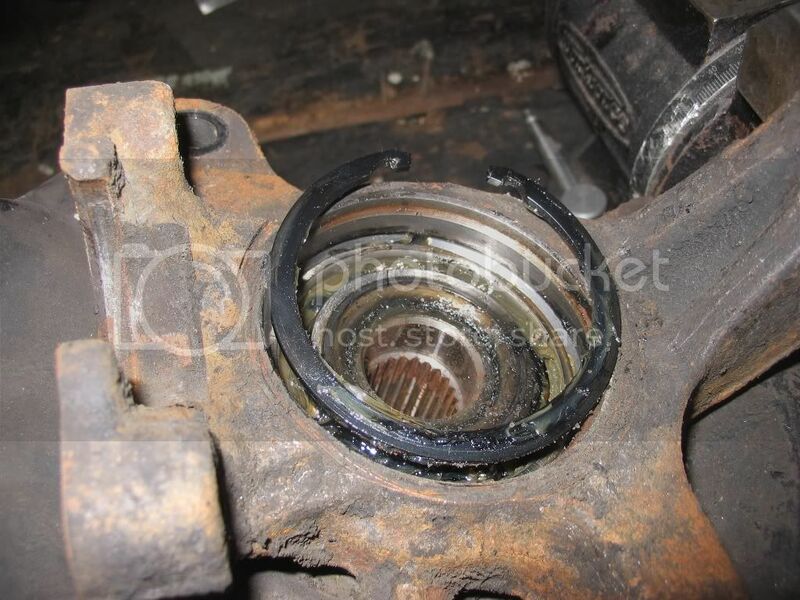 Use soft jaws to protect the outer edge of the steering knuckle and make sure everything is super clean so grit does not get in the grease of the new bearing. I wished I had been cleaner. Another view. This was a slow process and I repositioned the knuckle in the vise many times so that the new bearing did not get cocked in the bore. 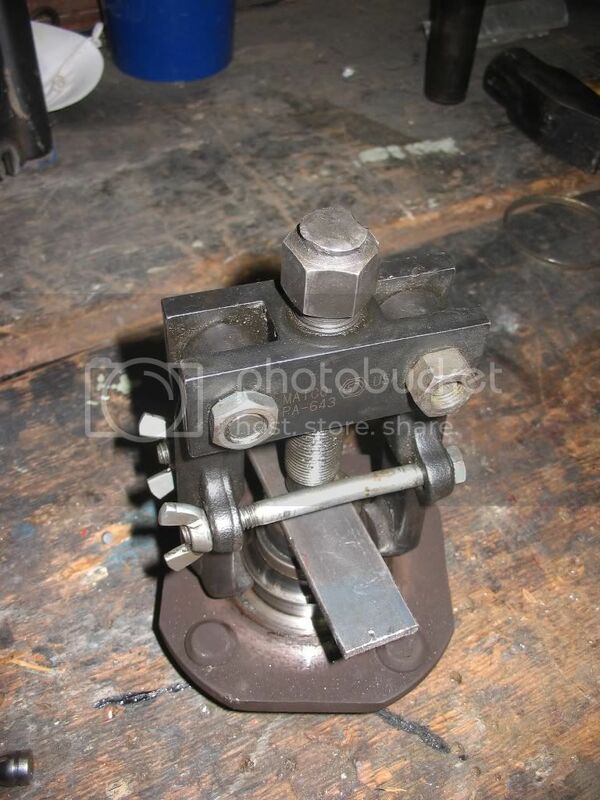 I also used a large C-clamp to augment the vice when the vice press appeared to be off center. Eventually I determined that the outer race had fully seated in the bore. I even tapped on the drift to make sure. 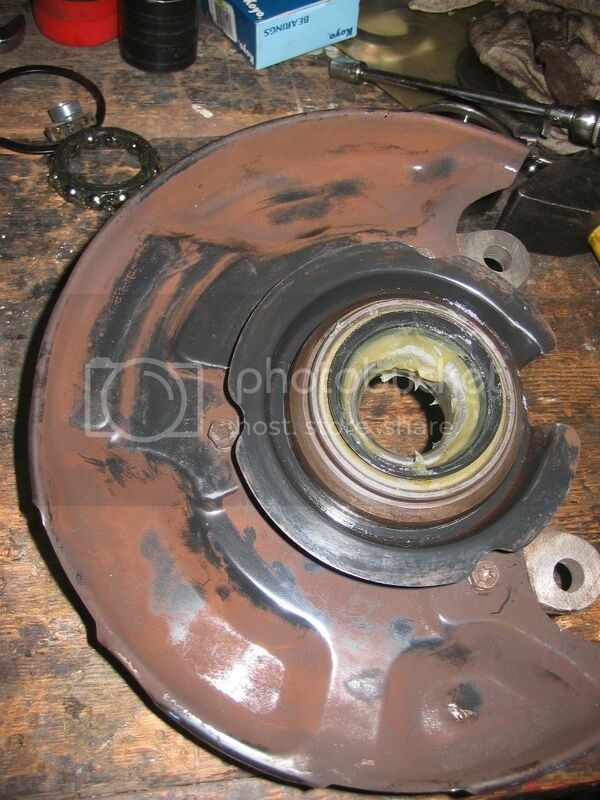 This shows the hub side of the knuckle with additional grease and the outer (smaller) seal installed. The steel brake shield also needs to be installed at this time. 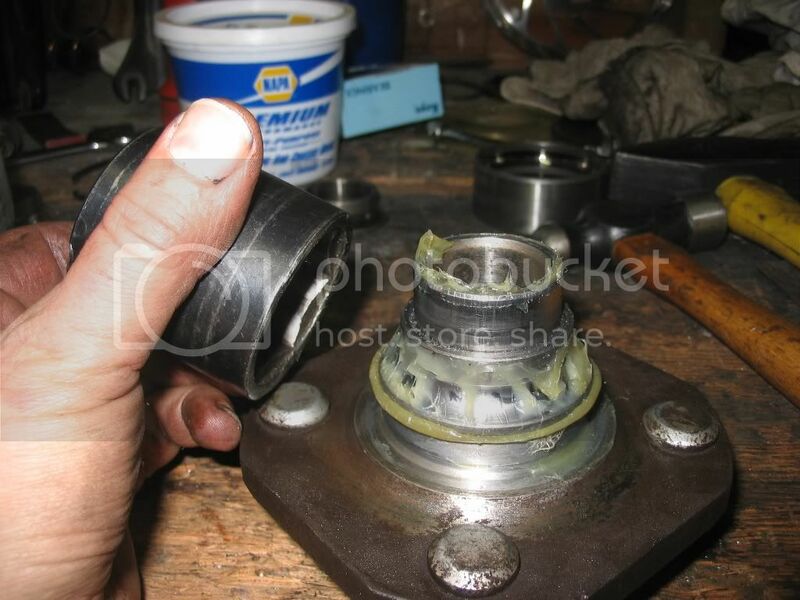 The bearing came already full of grease, the grease I added was between the seals and the bearing. I diverted from the FSM and installed the outer-inner race on the hub using a large impact socket to drive it onto the hub and seat it against the hub shoulder. I then inserted the hub with outer-inner race into the seal and outer side of the new bearing. 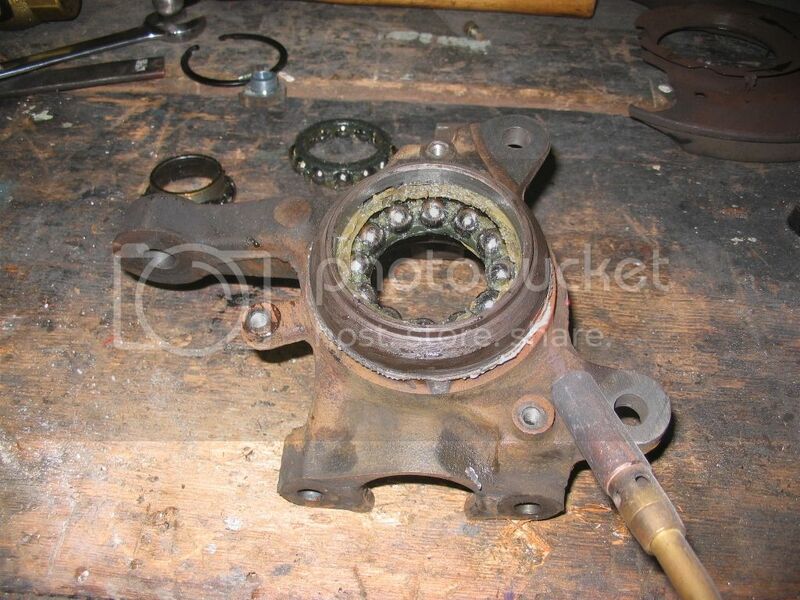 Then I put it in the vice and pressed the inner-inner race into the bearing. In retrospect I could have followed the FSM procedure, but I felt I was less likely to damage the bearing races if I pressed the outer-inner and inner-inner races on separately. Pack with grease and install seal and dust deflector. It appears possible to drive the seal too far into the hub so that it does not actually seal on the drive shaft - the FSM says 1mm below the top of the bore. The dust deflector is nearly impossible into drive in unless you use a stout steel ring of the same diameter or possibly a hardwood block. Put the knuckle & hub assembly over the drive shaft first and slip on the axle washer and thread on the nut to keep the hub from slipping off. 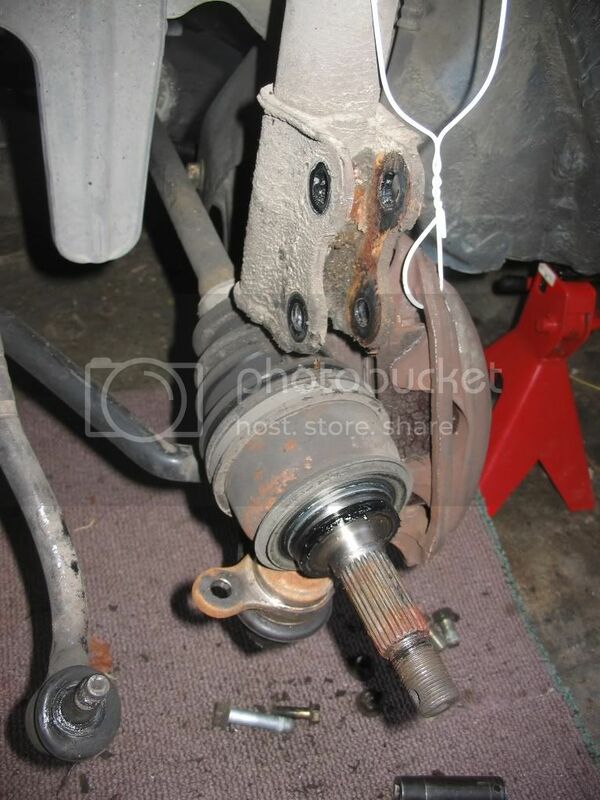 Then push down the lower control arm and position the lower ball joint and install it's bolts. 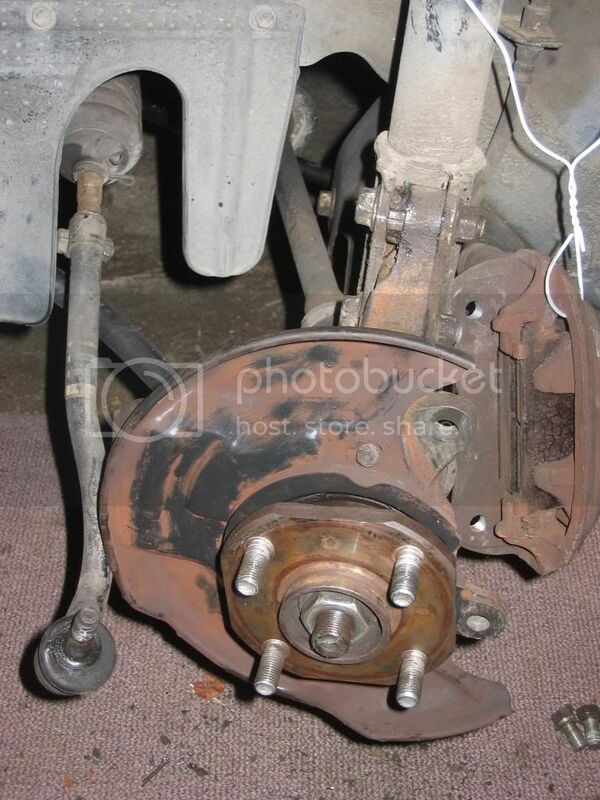 Finally push down on the steering knuckle assembly and insert the lower strut bolt. Once the lower strut bolt is in the rest is easy. Install the brake disk and caliper. Get your helper to step hard on the brake and tighten the axle nut to 137 foot lbs. Install castellated retainer and new cotter pin. Finally insert tie rod end into knuckle taper and tighten castellated nut and install new cotter pin. Check tighten all nuts and bolts. Install wheel and test drive. Last edited by sdoan on Tue Apr 15, 2014 10:16 pm, edited 1 time in total. WOW ! Simply - WOW! I am in awe! OT, but that is also a sweet vise you have. Most of the presses and bearing seating tools can be rented for free from most Autozone stores. It still looks like a lot of hard work, but the last time I paid a shop to replace a front bearing I think it was about $400. If I have to do it again I might remove the hub/knuckle and take it to a shop to see how much they would charge me to press out the bearing and install a new one. Or I might just do it all my self. How much did the new bearing assembly and seals cost? The bearing was $48 and the seal kit was $15 at NAPA. I was out the door with a tub of grease and no special discount for $70. 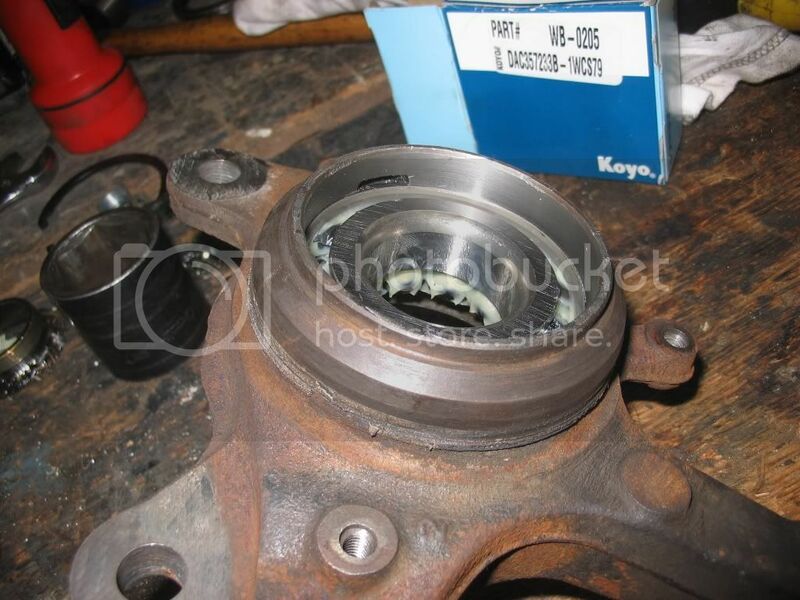 It was a real Koyo bearing and everything appears to be good quality. AWESOME write-up & pics... kudos!! 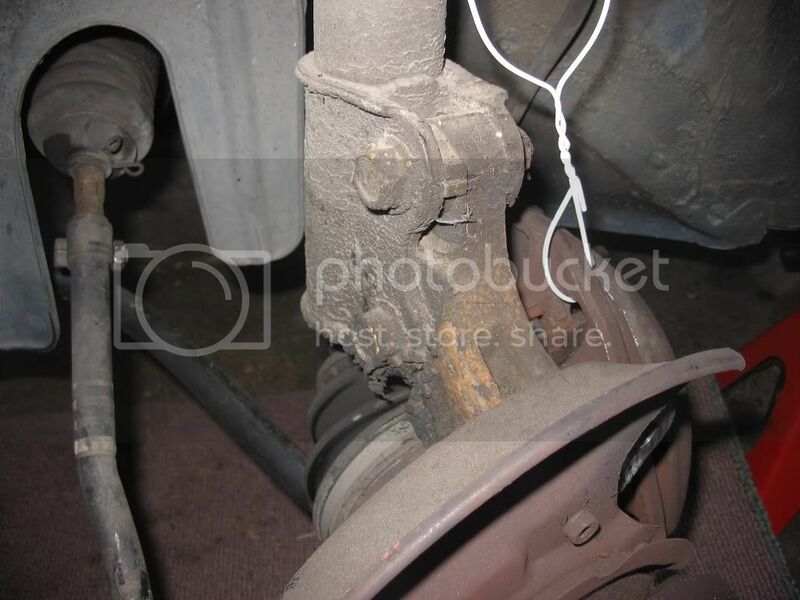 I'm pretty familiar with this area of the Terc, as I just finished installing new front struts, strut mounts, ball joints, and all new rubber and steel parts associated with the connection between the front sway bar and lower control arm. 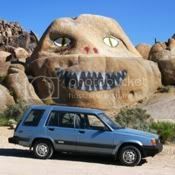 I don't have a digital camera to photo-document the process... but I did find a BUNCH of useful info here on the forum to help me complete the job successfully! Petros wrote: Most of the presses and bearing seating tools can be rented for free from most Autozone stores. It still looks like a lot of hard work, but the last time I paid a shop to replace a front bearing I think it was about $400. If I have to do it again I might remove the hub/knuckle and take it to a shop to see how much they would charge me to press out the bearing and install a new one. Or I might just do it all my self. 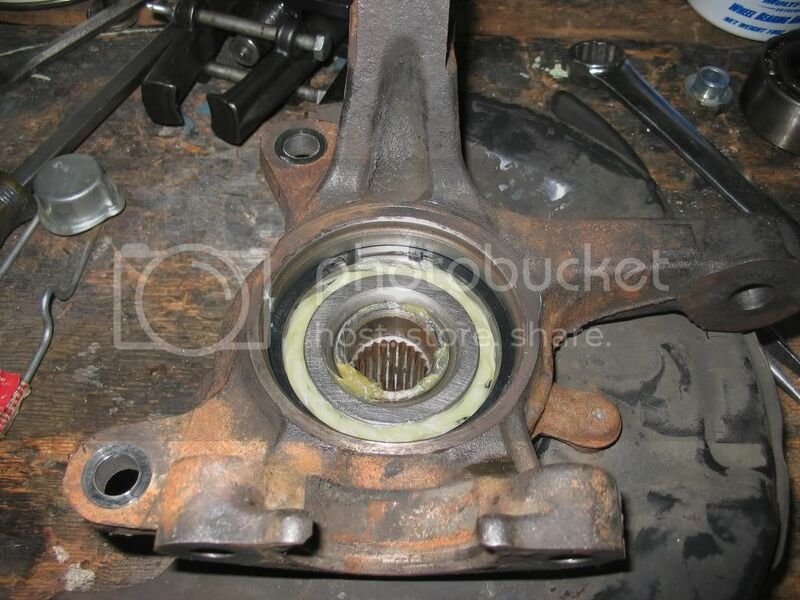 Labor from Lake City Toyota to have the hub and bearings pressed in and out is only $75 if you bring in just the knuckle. Labor is warrantied for 60 days too. Great write-up sdoan. Not something I was willing to take upon myself. Very impressive use of the vice and sockets. I'm thinking that the cost of having somebody else do the pressing might be worth it. That's definitely more involved than I had imagined. Thanks a bunch for this guide sdoan! I'm in the middle of this process now.....quite time consuming for a novice like me, but I think I'll get through it. Unless I can find a friend who can work with me to get the bearing in, I'm going to have it pressed in by someone with a press. Thanks for taking the time to take all the pictures and write it up. What's your disk brake rotor that's hanging on the wall to, sdoan ? 1984 Tercel 4wd Dlx. - 192K miles. Hey Moots, Good eye! I wondered whether you or Tom would spot that. It's an avid 8". I decided to use the 6" because I'm not a big downhiller, But it came with the disc set I bought second hand. Good luck with the bearing replacement. Using a press for reassembly is a lot easier (and probably smarter). I'm embarrassed - I did notice the bikes and the fork, but not the disc... I was going to ask about them back when you started the thread, but forgot... The cruiser (?) in the background looks like it has old skool Schwinn grips - true? I'm paying a mechanic today to do my from right, costing me $315. I have no hoist, and i honestly just dont want to mess it up. ARCHINSTL wrote: The cruiser (?) in the background looks like it has old skool Schwinn grips - true? You guys are GOOD! Yeah that's an old Schwinn cantilever frame bike probably from the early 70's. I was riding my motorcycle to a friend's house and saw it for free on the side of the road. I walked back a mile or so to get it figuring I could ride it to her house and ended up pushing it it was so rusty. Put about $100 into it including tires, tubes, chain, bearings and some really nice longhorn handle bars. Also have a really cool old Firestone Pilot (Dayton) from about 1940. They're great on warm summer days. I can't quite remember. I'm pretty sure I used a block of hardwood about the size of the ring and a hammer. I might have used a bearing race drift of the right size. Or possibly the old outer race. What I do remember is that I fit it up so it just sat inside the opening in the hub and started tapping. I thought it was in and it sprung out with the next hit. I had to go at it a couple times working around the edge with a light touch before it went in.